Crowd-Sourcing Science: What Is Animal Love? : 13.7: Cosmos And Culture What is animal love and how do we know it when we see it? Commentator Barbara J. King invites crowd-sourcing on this question, applying her own ideas to romanticized storks and home-living bunnies. If you've closely observed animals, jump right in. Crowd-Sourcing Science: What Is Animal Love? Day by day, I'm grappling with animal love. As the coldest part of winter sets in, I'm hunkered down, writing my book on animal emotion. But I'm stuck in a section on animal love. So today, instead of conveying some new bit of news in anthropology, animal behavior, or evolution, I want to invite some crowd-sourcing on a topic that brings together all three. Here's the central question I'm wrestling with: How can we tell, by careful observation alone (no hormonal analysis, brain scans or other invasive research allowed), whether nonhuman animals feel love for others of their own kind? As you see, I'm not asking so much about whether other animals may feel love because, like Marc Bekoff in this wonderful blog post from 2009 at Psychology Today, I am convinced that many (though by no means all) animals may do just that. But what is animal love? How do we know it when we see it? In fact, we could ask the same questions questions about human love. But let's consign that quagmire to another day. *Two individuals of the same species choose to stay together in contexts that go beyond survival and reproduction. While they may forage, avoid predators, or raise offspring together, they also choose to play, groom, rest or embrace together as well. *Emotional suffering results when the relationship between the two animals is severed for some reason. The separated animals, or the surviving partner if one animal dies, may stop eating, lose weight, become sluggish and withdrawn, or otherwise show through body language and changed routine a severe alteration in mood. You can see why I am still at the grappling stage! For one thing, using these criteria, love will be defined too often only in retrospect, once the relationship is over. For another, it's doubtful whether these criteria could distinguish between love and friendship. (Or, maybe, genuine friendship always encompasses love?) For a third, animals in the wild may ill afford giving off visible signs of weakness, so emotional suffering may be felt but hidden from view. Still, this scheme offers a platform from which to think scientifically about animal love. How would it apply in the real world? For five years in a row the male stork Rodan flew 8,000 miles from South Africa to a small village in Croatia, arriving always on the same day to rejoin his mate Malena. Shot by a hunter, Malena was unable to fly. Rodan's avian journeys ignited the romantic sensibilities of journalists, who proclaimed it "love." Invoking love between Rodan and Malena is premature, though, according to my suggested criteria. The two birds stayed together in tightly constrained reproductive contexts, and we have no way to know how Malena would have reacted if Rodan hadn't shown up, or how Rodan would have reacted had he arrived to discover that Malena was missing or dead. On the other hand, people who live with domestic animals often recount stories that seem to fit with my criteria. 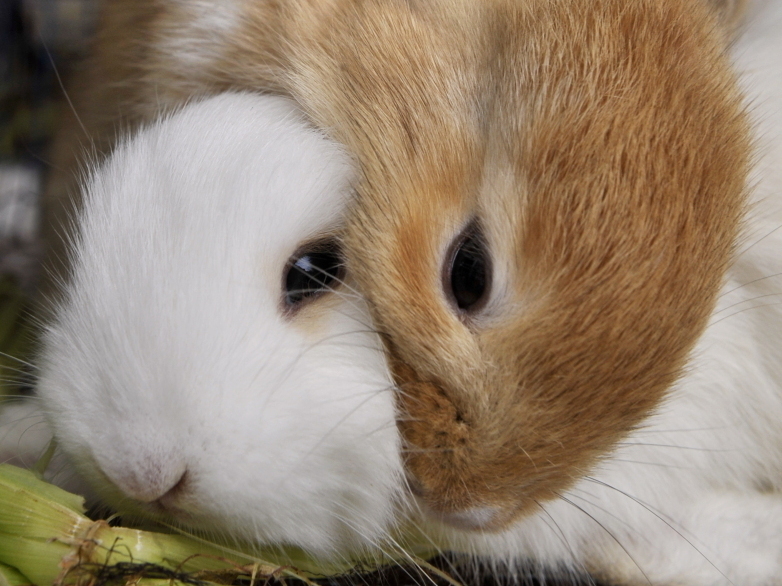 Two rabbits, for instance, often choose to be companions, playing and grooming together. When one dies, the other may become so distressed as to fall ill. The House Rabbit Society finds this situation common enough to include advice for owners of grieving bunnies on its website. Doesn't this point us towards the reality of lagomorph love? Maybe the trick with animal love is to go case by case—not only by species, but by individuals within each species. But back to the crowd-sourcing! Please do remember that my goal is not to defend my nascent ideas, but to open up the discussion. If you've spent time closely observing animals, please have at it: What is animal love, and how can we know it when we see it? I will credit any fresh ideas that find their way into my work as a result of our crowd-sourcing. You can keep up with more of what Barbara is thinking on Twitter.